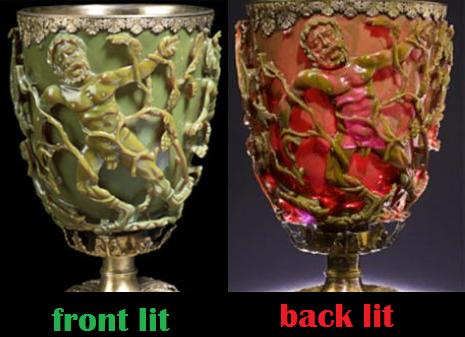 “The Lycurgus Cup, as it is known due to its depiction of a scene involving King Lycurgus of Thrace, is a 1,600-year-old jade green Roman chalice that changes colour depending on the direction of the light upon it. It baffled scientists ever since the glass chalice was acquired by the British Museum in the 1950s. but blood red when lit from behind. less than one-thousandth the size of a grain of table salt. The work was so precise that there is no way that the resulting effect was an accident. according to archaeologist Ian Freestone of University College London. When hit with light, electrons belonging to the metal flecks vibrate in ways that alter the colour depending on the observer’s position. Now it seems that this technology, once used by the Romans to produce beautiful art, may have many more applications – the super-sensitive technology used by the Romans might help diagnose human disease or pinpoint biohazards at security checkpoints. Gang Logan Liu, an engineer at the University of Illinois at Urbana-Champaign, who has long focused on using nanotechnology to diagnose disease, and his colleagues, realized that this effect offered untapped potential. Isn’t it ironic that scientists now turn to the works of our so-called ‘primitive’ ancestors for help in developing new technologies? The arrogant-elite modernists would like for you to believe that technology is progressing, yet there are so many examples of greater technology in the past. These elitest would have you believe that the “primitives just stumbled across this perfected art”.